There are inherent difficulties when defining an object/discipline. I’ve written about it elsewhere, using the word ‘henge’ as an example of the dangers of being too rigid, and how archaeology could pick up a trick or two from taxonomy. If you’d like to read it as background, it’s here. It’s nothing too serious – I’m 37% sure it was used as the basis for a question on QI, and if the QI pixie who follows me on Twitter wants to confirm/deny this, I’ll let you know. The discipline of archaeology it seems is not so flexible as the science of taxonomy. After the upheavals of the 90s it is still a little insecure about its own definition. Once upon a time it was enough that archaeologists displayed their credentials by saying ‘sherd’ instead of ‘shard’, and ‘kyst’ instead of ‘cyst’. Another defining quality was that they were so fascinated by old things that they would go out into the countryside and dig up fields in the hope that they may find some of them. This will no longer do – in an attempt to define itself archaeology now imports philosophies wholesale – it welcomes with open arms every box of theory smuggled over from the continent. It feverishly tears the box apart, holds the contents up to the light, and then tries to make it fit in much the same way as an anteater might attempt to squeeze snugly into a ball-gown. It may well manage it. It may well manage it without tearing great gashes in the fabric of it. It may even, with help, do up the laces at the back. It will still be, however, an anteater in a ball-gown. And it is because archaeologists sometimes feel as self conscious as an anteater in a ball-gown that they cling to their archaic peccadilloes instead of casting them aside and getting on with the job of being an anteater. Or possibly an archaeologist. I’ll be back in a minute, after this short walk. Right. Better. One of the problems produced by a change in nomenclature is the lag before the new version becomes commonplace, which is why it’s important to get the definition as close to right as you can to begin with. For instance, Brontosaurus hasn’t existed since 1903, when it was reclassified as Apatosaurus. But I’ll bet a pound to a pinch of salt you grew up thinking you knew what a Brontosaurus was. Brontosaurus rolls off the tongue more readily that Apatosaurus and is arguably a matter for the specialist to worry about – the lag for non-specialists was entirely understandable. Though it would be surprising if the transition from ‘henge’ to something more applicable took as long as the Brontosaurus transition. Far fewer children, for example, receive plastic replicas of henge monuments at Christmas, and are therefore less likely to compound the error over time by passing on the description to their offspring. Anyway. Where were we? Oh yes. Digital Archaeology. What’s that then? An example of a misapplication. ‘Cybernauts.’ I know! It’s how people used to talk in those days. He said ‘Matrix’ too – I saw. However, regardless of how far into the past these virtually pith helmeted investigators reach, they won’t be archaeologists. They will be archivists. As I was typing that sentence I received an email alert (subject: Digital Archaeology) with a link to this story about data retrieval from 5.25 inch floppies from the early 90s. They are not alone – it is a common mistake. An example of a failed application (a failure to apply, that is). In June 2011 the BBC broadcast an interesting program about the study of Egyptian archaeology using remote techniques – namely data retrieved using satellites. During the program (and in an accompanying news article on their website) Dr Sarah Parcak was alluded to as a ‘space archaeologist’ a number of times. However, space archaeology is an existing branch of archaeology devoted to the study of the material remains of human activity in space. It’s not clear where this error originated. For all I know the BBC researchers were diligent, and pointed this out to the producers of the show. And the producers of the show may well have failed to take note of this information, and decided instead to go with ‘space archaeologist’ because it sounded cool. We’ll never know. Or possibly care. However, what Dr. Parcak was doing was in fact digital archaeology. Which, should you be the kind of person who finds the phrase ‘space archaeology’ cool, probably sounds cool too. Should you also be a television producer, you could consider using it. That would be both cool and accurate. It’s the application of digital technologies in the study of archaeology. Just because a lot of people are using it incorrectly, doesn’t mean it should come to mean something which is incorrect. Hold the line. Be pedantic. 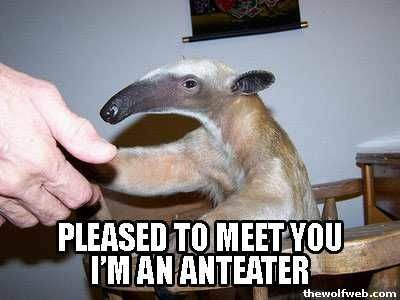 Embrace your inner anteater. But is the distinction between archaeologist and archivist as clear cut as this when dealing with digital information? We talk about web-SITES as things which are BUILT. Don’t they represent a kind of (im)material culture? Sometimes such sites are effectively abandoned but left ‘out there’ (wherever that is – we used to be encouraged to call it cyberspace, I recall) to undergo the equivalent of taphonomic change. For example, I have an old Myspace account which I no longer have access to (long lost e-mail/ password/username) but which still exists. A recent ‘visit’ (out of curiosity) revealed that the appearance and format of the site, including my little bit of it, had changed entirely since I last used it several years ago. Surely websites – much more so than documents – are subject to processes of almost constant change, as are the relationships/networks of which they are a part. With each update, earlier incarnations of a web-site become further obscured. Couldn’t it be argued that this amounts to a form of digital stratigraphy? Perhaps the issue here is the extent to which we view archaeology as an extension of history or a part of anthropology. But the study of such changes seems potentially well suited to a kind of ‘archaeology’. I’m serious, don’t take the (virtual) pith. Hi Dan – thanks for giving the subject some consideration and making a contribution. 1. Sites as things that are built. Sites exist as aggregations of data, much in the same way as magazines and books. The main difference is that they can’t be held. However they do have a material existence in as much as they are stored on and retrieved from various material storage formats. They are not immaterial culture as such. They exist inasmuch writing exists. Because we need a set of devices to read websites does not mean that they are not of the material world. I would argue that the taphonomic analogy doesn’t really apply here as what you’re describing is a series of renewals, as opposed to a process of decay. It’s an interesting example though. As you said, various design changes have occurred over the years since you uploaded your data, but (and please set me straight on this if it’s incorrect) your core data – your contribution – still remains intact, while the presentation of the site had changed around it. It’s cosmetic. Your suggestion that sifting through modifications and design changes amounts to digital stratigraphy is interesting. However, even if were provably the case (and I’m just about to argue that it isn’t) that wouldn’t automatically make it archaeology. Stratigraphy is not exclusively an archaeological term – in fact archaeology nicked it from geology (as it did taphonomy). Stratigraphy, as you know, deals with interpreting layers of data, the desired outcome of which is to establish the likely chronology of a site (archaeological site that is). To established the chronology of a series of websites does not require stratigraphy – the data isn’t organised stratigraphically. Additionally, the meta-data will provide an accurate chronology. If the meta-data is not present however, then the investigator will have to fall back on other approaches (the comparison of styles, the study of code syntax to provide at the very least a terminus ante quem and so-on). I’m still firmly in the camp that because it deals with documentation then it is in the realms of archivology (that doesn’t look right, I know – but it’s a real word. I checked and everything), regardless of the techniques used to assess chronology. An archivist may have a half dozen editions of the same book in from of them – sorting them in order of their issue would never be described as archaeology. Well, (maybe) controversially, I don’t view archaeology as an extension of either history or anthropology. I think the three are distinct disciplines which contain valuable techniques that can be applied to one another. I maintain that the phrase ‘digital archaeology’ should be restricted to the use of digital technology to support archaeological enquiry. With regard to the nature of data storage, I absolutely bow to your superior knowledge. I’m not convinced, however, that the internet can be seen simply as an archive of documentary material. Just because such changes are ‘cosmetic’ does that make them unworthy of investigation? Also, changing flows of information; shifts in focus and popularity of certain areas of the net; the abandonment and deletion of certain sites, theses seem worthy of investigation beyond the study of ‘Safeway margarine sales’. In no way am I arguing that archaeologists are automatically suitable of undertaking such study, only that there would be something inherently archaeological about it which goes beyond archivology (you’re sure about that?). This is new territory, probably as unfamiliar to your average archivist/historian as it is to most field archaeologists. Ultimately such study of the internet will surely emerge as a discipline in its own right, with its own nomenclature. Which would indeed leave the term ‘Digital Archaeology’ distinct to define “the use of digital technology to support archaeological enquiry”. Hi Dan – I’m certainly not sure about archivology, but it is a real term apparently. But that’s exactly what it is. A collection of files and documents stored on hard drives connected to each other by great lengths of copper wire (or fibre optics if you’re lucky – there’s an excellent piece by Neal Stephenson on the subject here – http://www.wired.com/wired/archive/4.12/ffglass.html – it’ll make you look at Cornwall differently too). No – you’re absolutely right. However the main thing is that the core data remains unchanged – the rest is wallpaper. And enough people like wallpaper to ensure it’s a study area in its own right. Additionally although the original writer may have been playing to the gallery, ‘Safeway margarine sales’, though perhaps not of crucial significance, are none-the-less historical documents. Hmmm. Yes and no. As you point out it’s early days, but I still contend that as long as it is documentary data it has far more in common with archivology than archaeology. The tracing and analysis of information isn’t the sole province of any one discipline, but there are some which suit the task better than others. As a space archaeologist concerned with orbital debris, launch sites and tracking stations, I do get a little tired of explaining that I don’t do remote sensing, and it is the actual satellite itself I’m interested in, not the images of terrestrial places that it can provide! But there is dispute about what space archaeology encompasses too – my colleage Steve Wilson has an good discussion of this here: http://spacearchaeology.org/?p=20. Definitions are tricky things and in the end I am inclined to let them define themselves by how people use them. Now let me go and put on my ballgown and look for some ants. Hi Alice – thanks for that – an interesting read. All of a sudden I feel lucky – at least we don’t get mixed up with alien hunters. I think inevitably these disciplines will (publicly) end up being defined by how people use them, but that it’s none the less not a bad idea for the practitioners to be have a definition they can be happy with (or at least all agree upon). As a matter of interest, how long has ‘space archaeology’ been a recognised branch of the discipline? In terms of being recognised by other archaeologists as legitimate, I would say only in the last few years, when a few of us have been asked to contribute to encyclopedias and handbooks. A decade or so of work to get to this point!